In the 1940’s, something scary happened- the wild whooping crane population had dipped to a mere 21 individuals worldwide. Realizing something had to be done, organizations across North America took steps to help save the species. 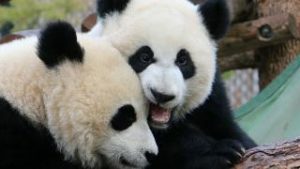 With the aid of the Calgary Zoo and other conservation organizations, the wild population is now approximately 600 individuals and increasing. We’re proud to say that since 1989, the Calgary Zoo has been part of the captive breeding program for this iconic Canadian Species. But what does that breeding process entail during the calendar year? We talked to Curator Colleen Baird, who leads the whooping crane artificial insemination team, and oversees the Calgary Zoo’s work with the cranes. She explains that this team will practice their techniques with the sandhill cranes at the Devonian Wildlife Conservation Centre, and then will move on to the whooping cranes when they feel that they are ready to tackle this important task. The team went to work to match the genetics of the potential whooping crane pairs, organizing the cranes with the best genetic change of creating healthy future cranes for the program. Each young crane in the zoo’s care is given a few years to naturally breed, and to see if they are a good fit within their pair. The successful pairs are maintained, and then it is decided which of the pairs need helping along with artificial insemination. By May of each year the pairs for the rest of the year are organized and ready for artificial insemination. The AI team works with the cranes three times a week, catching them, collecting the sperm of the male cranes, and inseminating the females. If the insemination is successful, the birds will start to lay eggs (two eggs per clutch). Eggs are pulled from the nests and placed under surrogate sandhill cranes to foster incubate the precious whooping crane eggs, because removing the whooping crane eggs allows them to re-clutch and produce more eggs for release. The eggs will then remain under a surrogate for minimum of 15 days. Every egg is closely monitored by the team, including even using a fake datalog eggs. These datalog eggs can be matched with a real egg during inclubation, and will record how often the egg is turned, as well as the temperature and humidity. By this time, it’s mid May and June, and the eggs are ready to be shipped to the facilities in the U.S! The Calgary Zoo is the only institution in Canada that works with whooping cranes in this way, and the third largest captive breeding facility in all of North America, so we work with excellent partners south of our border. There are several different locations that we partner with, and the eggs go to whatever location is best in terms of availability of space. The eggs will either fly to the International Crane foundation in Wisconsin or the Patuxent Wildlife Research Centre in Maryland. About 20 days after being laid, the eggs are shipped, and they will hatch anywhere from day 28-30. The eggs are carried South by hand on planes, protected in cozy incubators. Once arrived, these growing crane populations and their recovery are managed by both the Canadian and U.S Fish and Wildlife organizations (breeding facilities such as the Calgary Zoo work with many stakeholders to save this species). Their fate in these American breeding facilities is determined by several factors, some of which are: allocating the new cranes to different flocks, and picking the strongest cranes genetically to continue to breed. There are currently several successful flocks of whooping cranes in the U.S- DAR (direct autumn release), the ultralight flock, and the Louisiana flock. After the new cranes’ legs are banded in order to identify them from each other, Fish and Wildlife will monitor the flocks, and collect new eggs. On the Canadian side, now that the season is wrapping up, our whooping crane team will meet, debrief, and decide how they can carry on their successes into the next coming season. 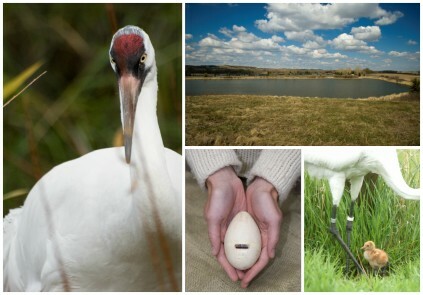 So far, it looks like 2015 was a great year, as our eight pairs of whooping cranes laid 15 eggs, and 60 per cent of the eggs laid were fertile and able to be shipped to the U.S. So continues the cycle of whooping crane life! Click here if you’d like to learn more about our conservation work, and help support us in our journey preserve the whooping crane.